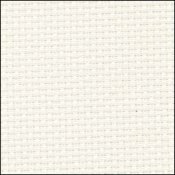 Antique White Aida 14, 60 x 1, minimum 36  - $0.90 : Yarn Tree, Your wholesale source for cross stitch supplies. Shopping Cart Home :: FABRICS for Cross Stitch :: Aida 14 :: All Aida 14 :: Antique White Aida 14, 60" x 1", minimum 36"
Item 3151. Antique White 60" wide Aida 14 sold by the inch, MINIMUM ORDER 36". 100% cotton, excellent quality fabric. Perfect for those making kits or for over-dyeing as you can specify the length of your cut piece.